I have been painting for a while now but haven’t shared anything on my website. Here are 2 easy DIY pieces that I made. 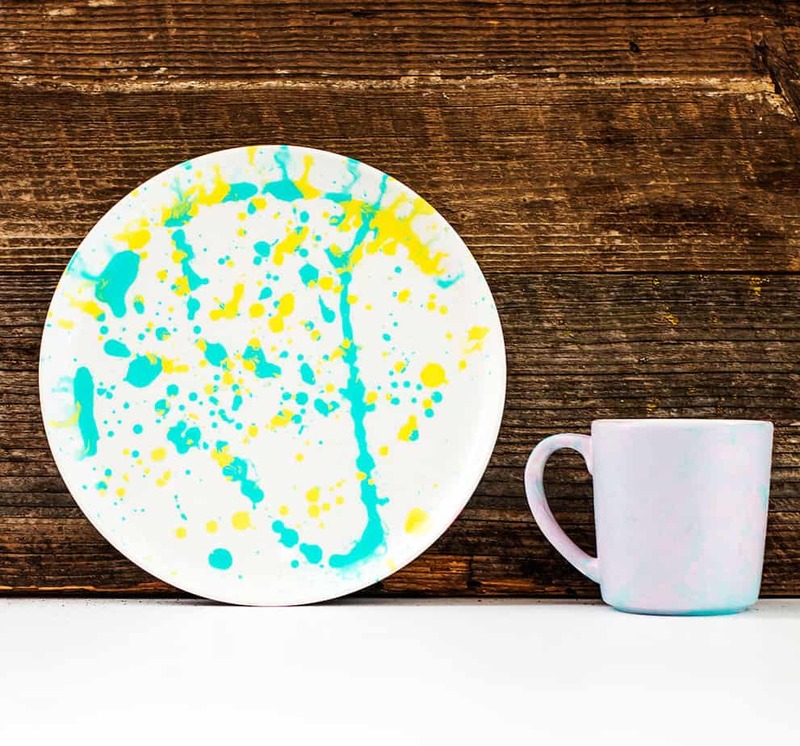 One is a plate with just a couple of colors… no instructions needed, just a couple of colors of paint and a fun attitude and just a few minutes of your time. 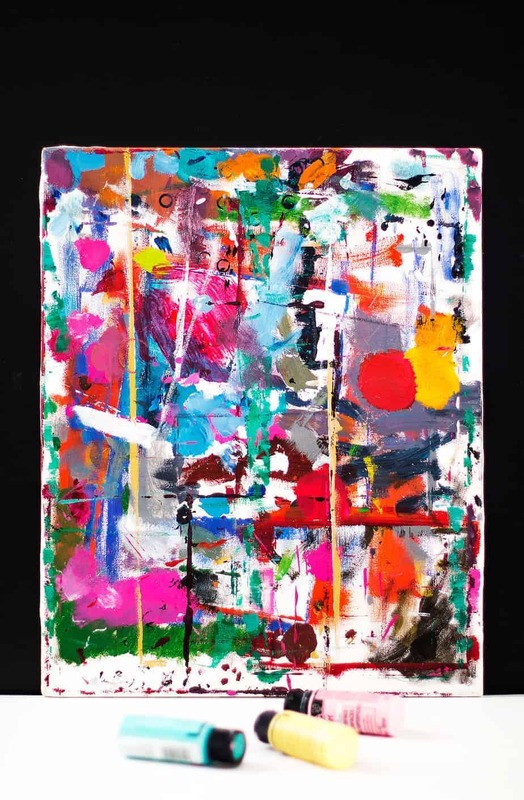 The second one is an abstract painting that I made, with tons of colors, shapes and everything else! It is very chaotic, and although it’s not for everyone I really enjoyed making it and have a room that needs something really bright and lively…this should do it! I think abstract art is all about what is inside of you, but I do have some general tips on expressing yourself through art. I love being able to express myself wherever and whenever possible. I take advantage of the little opportunities to do so, oftentimes in what I wear and bring with me every day. This may be a really funky pair of leggings, or a vintage handbag that I picked up from thrift store. A lot of my favorite accessories are from brands and designers that I’ve never heard of, while others are from the most famous out there. I would kill to have an old VW van that was custom painted in light yellow. That’s a steep purchase, there are some easier and more affordable ways to show your artsy side. Do you have a plain looking phone? After you check out the Moto X Pure Edition I think you’ll see why it’s a great time to upgrade. They’re designed by Jonathan Adler, an iconic designer whose work spans many mediums from pottery to interiors. His patterns are gorgeous, eye catching and memorable. It’s so cool that you can now have his designs right on the one thing you take everywhere you go! The phone’s specs are shown below in the article. Creating your own art is another great way to express yourself. The process in doing so is for me as important than the end result. When I paint, even the first steps of mixing two colors to get a third is fun and soothing. Painting is therapeutic, not so much an escape from my day-to-day but more an introspective discovery process. I never did all that well in art class when I was younger so I figured I should steer clear from it altogether. Much later in life I realized how much I enjoy it and really need to do art. We all have a creative voice that needs to shout out and be heard every now and then. Painting has become my primary art form but my tips are applicable to most any art medium. – First and foremost, don’t put too much weight into what you hear from anyone else, including me. It’s all about finding what works for you, so take all of these tips with a grain of salt. – The worst thing you can do when expressing yourself artistically is to worry about what other people will think of your work. Keep negative thoughts far away. – I always turn the TV off, and instead listen to music. o For me the best music to paint to has an evocative edge to it… David Bowie (RIP L), Philip Glass, Santogold… find something that inspires your creativity. – I keep plenty of paper towels and water handy as things usually get messier than planned. – If you’re using acrylic paints, be extremely careful! Some unnoticed blue paint on your shirt can then spread to the carpet, chair and bed (yes that happened to me). – If you find yourself sitting there for more than 2 minutes with an intimidating blank canvas staring back at you, just start painting something. Getting over that initial mental block is a huge first step, and if you have a set of lines or shapes or colors already going it will trigger more thoughts and ideas. It’s unlocked, which means you can use your Moto X on any network, and switch carriers whenever you want – without having to buy a new phone. Thank you to Motorola for sponsoring today’s post and inspiring me to share about the Moto X Pure Edition! Game Day Recipes and Party Preparation! Oh wow. The housing designs of the Motorola X are beautiful. I love all the beautiful styles. This is so cool – I love it! The phone case designs are super cool. I don’t know how much anyone would like to eat on the dishes I tried to paint! Those are really cool! My son and I would love to do that kind of stuff. It’s easy and we can use the plates that’s the best part ever. This sounds like a great idea for me to do! I’ve always used creative outlets, but never really got into paint. This looks like painting I could get into, though! I want to make a plate and let each of the kids do one as well. I love all of your suggestions, very artistic and interesting. I love painting. I do it as often as I can which is at least once a month. My girls love to paint with me as well. How crafty, I love the designs you created. I really love that first one you did with the square plate. Those colors are beautiful! This would be a really fun and easy DIY project for sure! I love the back cover designs of the Moto X. It helps show off the owner’s personality and I like stuff like that. One more awesome thing about the Moto X is that it is unlocked! I can go prepaid or postpaid with any carrier I choose! I love your painting and plate. Great photos! Thanks for the painting tips. Some of them may help with writing too. You are creative …love to express myself with style and music. I was never good at painting. But thanks for the tips! Those motorola phones are really nice. Thanks for sharing! We are very artsy and crafty in our family and have been crafting with my kids (my mom and I) since they were about a year old each. I love the paint splattered paint and would love to let all three of the kids create their own, it would make for three great art pieces on my wall. Your plates looks so good especially the first one. You are so talented. I am not a very crafty person but I would try this! Thanks for the idea. I would love to paint a plate. Your painted plates are so cute. This is so creative. Those cases? I love that! But I am never good at painting. I am in the mood to paint today,and just may do so with my daughter! Love the plates you made. So beautiful. It is apparent you love art! I like how you went from the paints to the phone cases and it’s all about the expression of your artistic self. When I was younger, we painted nearly anything we wanted through ceramic art. I haven’t done it in years although my mother still owns a kiln. It would be so therapeutic to make plates or even lamps, or coffee cups – something to express my own true self. What beautiful paintings. I love the splatter effect, it’s one of our favorites in the house. The plates are gorgeous. You are so creative! I love the plates! My son would have a blast making some with me. You are so right, we express ourselves everywhere we go – a lot of times through body language, which I sometimes need to work on. 😀 But I love the idea of not being afraid of art and just arting for the act of arting and expressing ourselves. Love it! Love your brightly colored painting, , you are very creative and I would love to be able to express myself in art! I love to paint. I hate when i have a few good ideas and once i start my mind goes blank. The Moto X looks like a great phone. It have a good camera on it which i always look for in a phone. These seems fun as an adult project! The colors you picked are perfect together too! Such a great idea. My daughter is the artist in the family. She would love doing this with me. Hoping to use my sketch book more. I need a creative outlet! I’ve been thinking about going to a painting studio and see what I can come up with. I’d like to tap into my creativity a little more. what a good idea to try with the kids and so simple. great for grandparents gifts!